My wife, Donna, saw an article on Huatulco – What’s Up about the turtles at Playa de Escobilla. We decided that we should go see them. 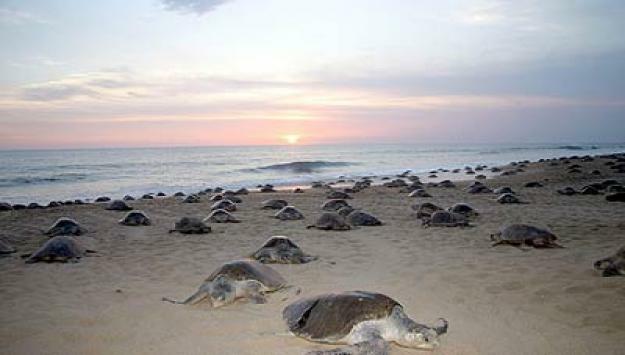 Playa de Escobilla Sanctuary is a waterfront sanctuary for sea turtles about 30 km east of Puerto Escondido. It is one of the world’s major nesting grounds for the Olive Ridley turtle (Tortuga golfina). 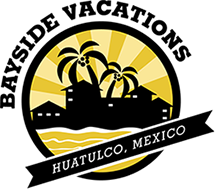 The article mentioned Oscar Tours Huatulco. Donna called Oscar Velasquez Ramirez at 958-107-5579 and booked a tour for that day. We were picked up at 3 pm by Jamie, a most knowledgeable driver who speaks excellent English. The tour was underway. Two quick stops later and the tour had grown to 6 tourists, along with Oscar and Jamie. The drive to Escobilla takes about 1½ hours. It was a very short drive because Oscar filled the drive with information about the turtles and the Sanctuary at Escobilla. Thousands of female Olive Ridleys arrive at Escobilla each month from May to February to lay their eggs. Numbers peak at night for a period of about a week around the full moons. This spectacular phenomenon is known as an arribada. To protect the turtles, there is no general public access to the beach. The Mexican army enforces this. The Mexican government pays the biologists working at the Sanctuary. However, all the other workers are volunteers, and it takes hundreds of volunteers to keep the turtle sanctuary running. These turtles are solitary, preferring the open ocean. They migrate hundreds or even thousands of miles every year, and come together as a group only once a year for the arribada, when females return to the beaches where they hatched and lumber onshore, sometimes in the thousands, to nest. When we arrived at Escobilla and walked down to the beach there were hundreds of turtles, in various stages of laying eggs. We watched a female digging a hole for her eggs, using her back flippers as shovels to remove the sand down to the level where she felt that the temperature was right. Once she reaches the proper depth she starts dropping her ping-pong-ball-sized eggs into the hole. The liquid that is released along with the eggs offers the eggs some protection from predators. 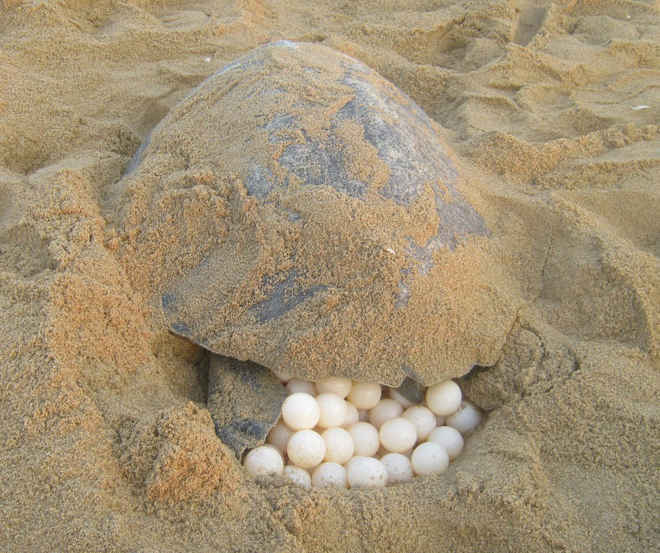 After dropping all her eggs, the turtle fills the hole with sand and compacts the sand using her flippers and rocking her body. Once this mission is complete, she returns to the sea. Once we had observed a number of turtles laying their eggs and had taken hundreds of pictures, Oscar had a bonus for us. He had arranged for us to release about 30 newborn turtles into the ocean. 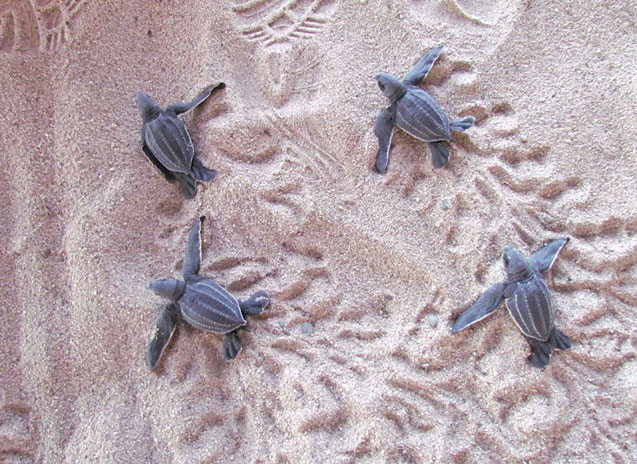 The three ladies were given the honour of taking the turtles from the pan they were in and releasing them onto the sandy beach, and the race to the ocean was on. There was still a bit of daylight when we released the turtles and that attracted seagulls, so the race was over almost before it started. Oscar, seeing the seagulls, quickly picked up all the baby turtles and placed them back in their holding pan, to be released later when it got dark. After dark the release went off without a hitch. I have to point out that the baby turtle that I picked won the race to the ocean. There was no prize for winning except the satisfaction that I picked the winner. Before releasing the baby turtles, Oscar showed us how to properly pick up the babies to protect the umbilical cord on their bellies. The umbilical cord provides the baby’s nourishment for about 7 days until they find algae and seaweed to eat. By now it’s almost 7pm and time to start the 1½ hour drive back to Huatulco. On the ride back, Oscar provided us with his wealth of knowledge about turtles and the turtle sanctuary. -Olive Ridleys are the smallest of the sea turtles, weighing up to 100 pounds and reaching only about 2 feet in shell length. 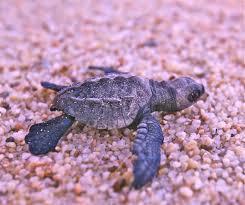 -Olive Ridleys have nesting sites all over the world, on tropical and subtropical beaches. During nesting, they use the wind and the tide to help them reach the beach. -Though the Olive Ridley is widely considered the most abundant of the marine turtles, many governments still have protections for Olive Ridleys, because eggs are taken and nesting females are slaughtered for their meat and skin. Fishing nets also take a large toll, frequently snagging and drowning these turtles. Back in Huatulco Donna and I discussed the value of the tour and we both agreed that it was one of the most educational and informative tours we have ever taken. Would we do it again? In a heartbeat! But instead of doing it again Oscar also offers a tour of a Coffee Plantation and a tour of the Zapotec ruins at Copalita. Next stop – the Zapotec ruins. Thanks again, Oscar, for an excellent tour.